When it comes to epic adventures this slot has it all. 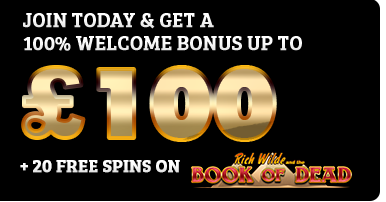 Swords, sandals, ridiculous numbers of Free Spins. Net Entertainment draws its sword on the fantasy action genre in the Warlords: Crystals of Power Slot. A five reel, 30 pay-line effort that will have you wielding your reels like a banshee in a hurricane. 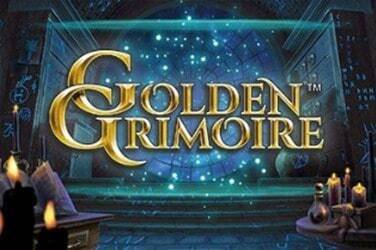 With a title like Warlords: Crystals of Power, this online slot is only going to go one way. Set in a fantasy realm – and with an epic into that HBO would be proud of – a Samurai, Priestess and Barbarian battle each other as the last three rulers of the world. They are aided by mysterious magic crystals, appearing during the base game as our Wild symbol and substituting for all other symbols except Scatters. 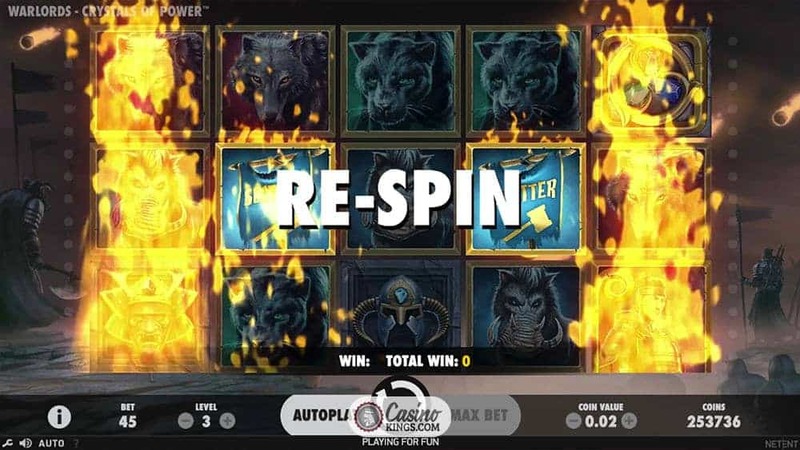 All the key players of this tale are represented as our game symbols – incredibly visual and superbly brought to life when we land winning combos across our 30 paylines. The three Warlords appear as stacked symbols with their companions – a Wolf, Panther and Boar – while each of these beasts also boasts their own snarling symbol. The backdrop to our action? A hazy battlefield, roused expertly with stunning visuals and epic sound score. If you thought you had done battle with epic bonus features you’d better cast your gaming eyes on these bad boys. 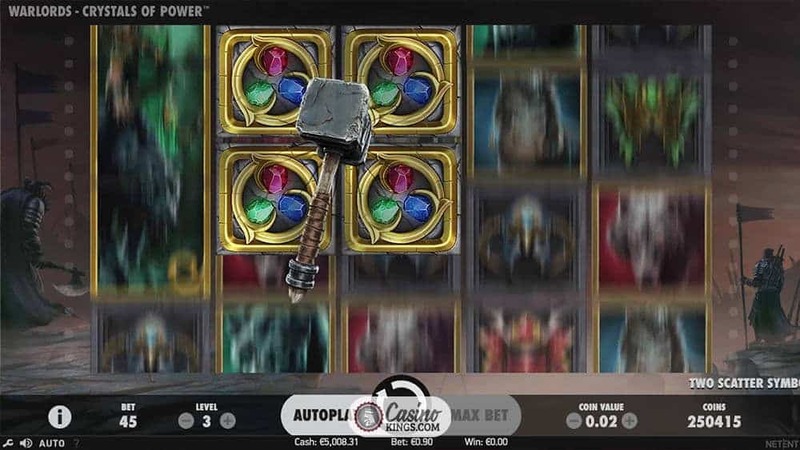 NetEnt loves its in-game bonus features, so the randomly-triggered Overlay Wild feature sees either a block of four symbols appear as Wilds – representing the smashing Barbarian Warlord’s hammer – while the Priestess’s arrows and the Samurai’s swords deliver between 2-5 Wilds across the reels. And then come the dedicated bonus rounds. 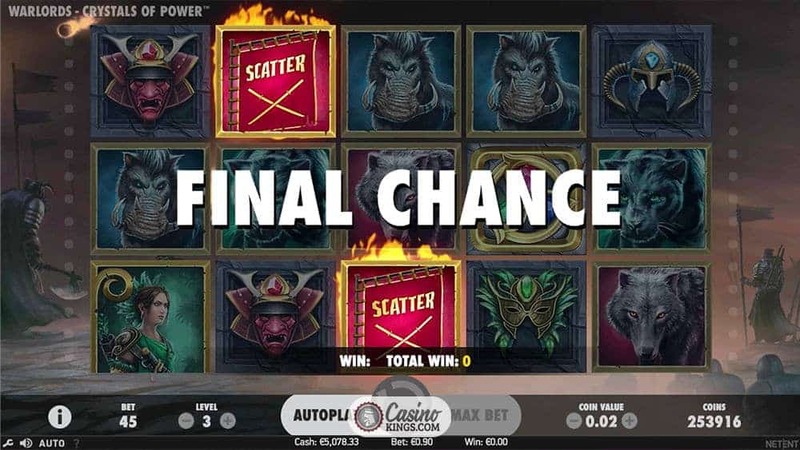 With each ruler’s flag representing a Scatter symbol, we are looking to launch either the Barbarian Free Spins, Priestess Free Spins or Samurai Free Spins, triggering 9, 7 or 5 free spins respectively. 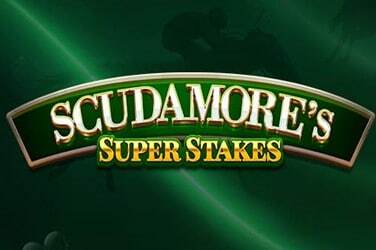 We could land three Scatters straight-off – happy days. Or, in epic style, we might have to battle it out for a victor. 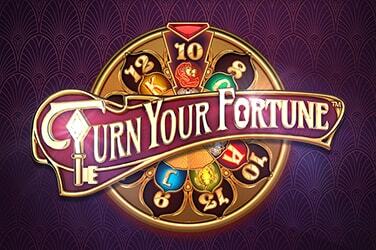 Should we land two or three different Scatters, these Scatters will clash to launch one of our Free Spins variants. 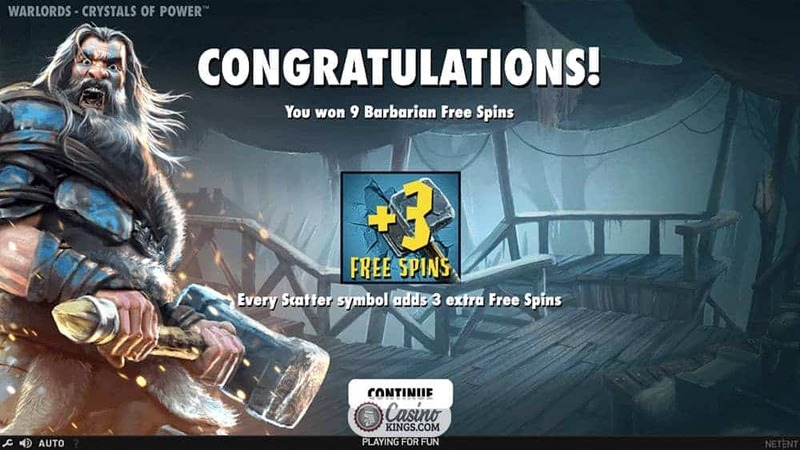 Landing the Barbarian Free Spins delivers 9 free spins, but with each subsequent Scatter we will earn a further three spins. 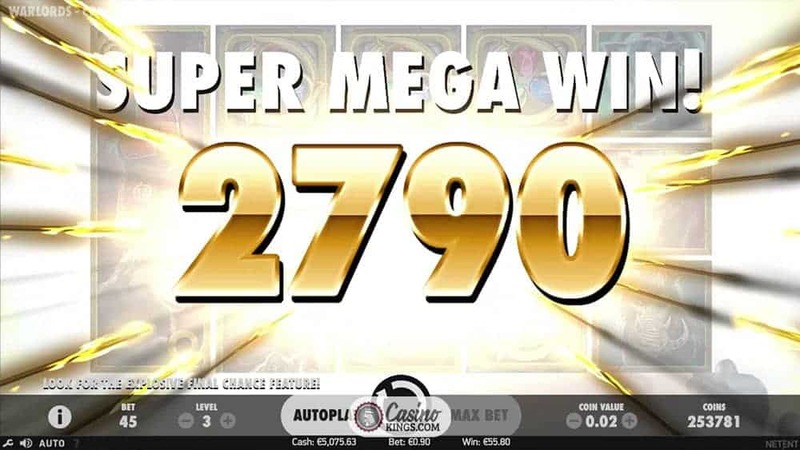 This is uncapped and unlimited, potentially fueling a furious Free Spins feature that will take its toll on the reels while having the opposite effect on our e-wallets. 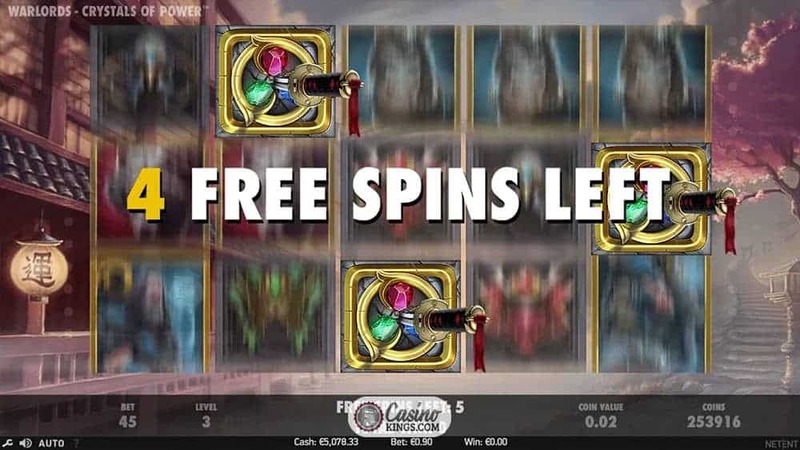 The Priestess Free Spins or Samurai Free Spins will not deliver extra spins during the feature, but for each Scatter we land the Priestess grants us an additional x1 multiplier – and potentially leading to a whopping windfall 6,666 times our stake – while the Samurai lashes a Sticky Wild on to the reels in place of every Scatter for the remainder of the feature. Epic. Warlords: Crystals of Power is as gripping as the name might suggest. 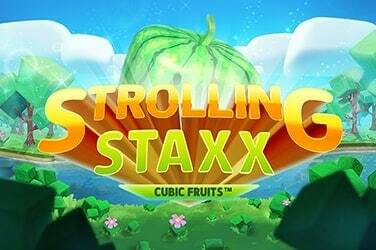 Even a gamer indifferent to the fantasy genre will find plenty here, not least the 6,666 times our stake potential gravy from the Priestess Free Spins. Fantasy fans will be in hogs’ heaven. But will we see you in RL again?